Later this week there’ll be more sewing soul contemplation. Today, I am taking you on a quick, mid-week scroll through my current fixation on pencil skirts. Specifically, denim ones. A custom-fit, deep indigo skirt, tapered at the knee. (1) Curve-hugging enough to distract my husband from a computer game, (2) conservative enough to run an all-day tech company meeting, and (3) durable enough for changing a flat tire on my pickup truck…or a small child covered in mud. I want this skirt in my life so badly, I hired a couturier to teach me how to make one from scratch this fall. I’ll share more about that experience down the line. For now, let’s peak at a few of the high-end ready-to-wear skirts I’m inspired by and maybe even “pencil in” how they might look on me. Starting with this simple one from Citizens of Humanity. A high, contour waistband and a center front seam, this basic skirt is also showing some quiet rebellion with its boldly angled pockets. It’s like that front panel starts off wanting to be a middle gore in a three gore skirt, but then changes its mind when the center seam shows up, maps out a smooth exit, and juts off to the side seam in creative protest. This Burberry beauty is a bit deceiving on the curve-hugging front because its made of stretch denim. But, those style lines are what caught my eye. A classic, sporty denim skirt with all of the expected features until your eye is lured down the thighs by a hypnotic pair of double-topstitched, flat-felled seams. Now, what about the collar-and-a-peplum-had-a-baby feature of this $500 Moschino skirt? Bringing that kind of attention to my waist might not be the best decision. Or, it could be the missing link. As long as I never find myself transported to the 1980s where I might get the urge to “pop” the collar, the style might have a chance on me. Look out for more inspiration sketches on Instagram, the dumping ground for my design impulses. Seriously, though, I am physically restraining myself from sketching and sharing more right now. A sign that it’s time to head back to real life where our fingers are crossed that no truck tires or tiny muddy people need my help today. This entry was posted in Design Notes, Sewing Inspiration and tagged croquis, croquis sketch, denim, design inspiration, pencil skirt, sewing blogger. Bookmark the permalink. I love pencil skirts! I miss having one, I used to wear them all the time when I worked. And wow! Someone is going to teach you how to make one!! That is very cool. I like the skirt with the collar, but on my apple belly, I just know that collar would flip up and stand straight out, lol! Oh, Nita!! That’s exactly my fear too! My short, thick waist was not what the designer had in mind. But, if I could pull it off somehow, I’d feel like a ninja. 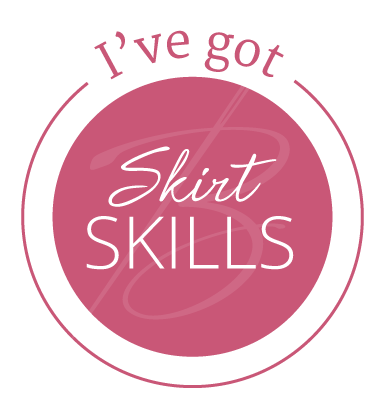 I am terribly excited to learn to make custom skirts. The course I’m taking is 6 weeks long, but I wish I could absorb it all in a day! I like this concept- I need to embrace sleek lines, but I’ve never found a zip front that didn’t run the risk of creating the dreaded ‘polterwang’ when sitting. Ha! That’s what that it’s called!? What a hilariously perfect word for the phenomenon that haunted my entire, ill-fitted youth! Thanks for the mind-altering lesson that got me sketching on my old croquis again. My pleasure. It is a joy having you in class. I like the Citizens of Humanity skirt. It has a smooth, go-with-anything, unassuming look. The Burberry has nice lines and would work for someone with a flat-ish belly. I find the Moschino hilarious. It looks like a denim jacket with the sleeves cut off. Idk, maybe it’s me. $500? Wow. I’d better stick to sewing. A cut-off denim jacket skirt!! That is EXACTLY what it looks like! And, probably why I’m drawn to it. I love denim jackets. As a native Northern Californian, I spent the first 21 years of my life with a denim jacket as a winter coat! Since I’m learning to custom-draft skirts, my belly size (pooch and all) will be accounted for in a slim skirt design like that CoH skirt. But, you’re right. A gal with a rounder tummy would have trouble fitting in that Moschino skirt off the rack. With that $500 price tag, you’d think alterations would be included.